The Telex Airman 8 ultra-light aviation headset with battery-free active noise reduction (ANR) offers innovative features that provide increased comfort, durability, and ease-of-use for professional pilots, air fleet operators, and aircraft manufacturers. Eliminating the need for batteries and special connectors, this ANR headset receives power from its unique microphone system. The ANR switch has been placed on the forward-facing ear cup side allowing an easier reach without having to remove the headset. A high-quality, amplified, electret microphone provides clear voice transmission while improved ANR and noise cancellation ensures superior in-flight communication. Extending its useful life, the headset is constructed with a stainless steel headband with metal pivots and a pre-coiled, overhead coiled cord. The microphone boom design provides stronger rotational stops which utilize the full diameter of the ear cup. The soft headband pad combined with a lightweight design improves comfort—even on long flights; further enhancing comfort, the yoke allows the ear cups to move in all directions. An acoustic limiter protects users against sudden increases in sound levels. 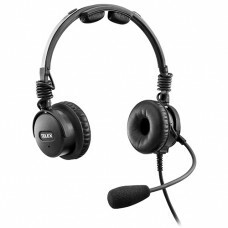 The Telex Airman 8 ultra-light headset (8-0210) with battery-free ANR is a double-sided headset that includes dual PJ connectors (PJ-068 and PJ-055) and has a 600Ω impedance. The Telex Airman ANR 850 Headset is General Aviation ANR & combines the clarity of ANR, the comfort of a lightweight design, and the convenience of not having batteries to worry about. This Microphone Cover fits over Telex Airman 850 headsets. Reduces wind and ambient cockpit noise.